When we are anchoring, I stand at the bow and Peggy is at the helm with the engine running (we have not 'sailed' to anchor yet.) And communication from the bow to the helm is fraught. Peggy is beneath the Bimini and I'm 30' away in front of the Mast and the Dodger is in front of the Cockpit, so a clear line of sight is often obscured. For example, when I need Peggy to put the boat into Neutral, I tap my head, and when she sees that signal, she is supposed to acknowledge, just a simple (OK) suffices, but sometimes she'll reply 'Neutral!' But, if she does not see me, then I can have a sore head from banging it furiously with one hand while trying to hold the anchor chain with the other hand or foot. If she does not see me, or I don't hear her acknowledgement, it gets frustrating and, typically, I turn, Whistle, and bang my head again. Peggy has been pushing for us to get headset communicators for over a year, but I thought we could get pretty good with our hand signals during anchoring and navigation around blind corners on the New River. 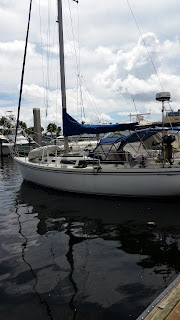 We saved over $500 by not going to the, now extinct, Strictly Sail Miami (saved the Hotel cost) so, logically ;) we had some spare $$$. So I took a break from painting our home exterior to open the box and check it out. Very comfortable, but I think I'll add a lanyard just in case they get knocked off when I'm at the bow. I didn't think my glasses were normally tilted, and have to try them out wearing a hat to cover those locks. Very neat dual battery charger, but why did they not include a 12v or USB power cable to the battery charger? 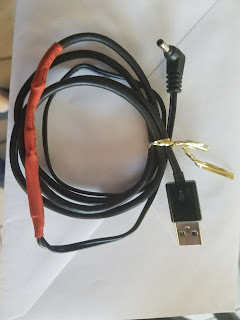 So it would seem simple enough to make a 5v USB charging cable so that we don't have to plug the charger into an Inverter aboard the boat. We tried them out at home. With me working by the Pool Pump (it's too cold for the Noisy AC system to be running) Peggy could hear me above the sound of the TV and I could hear her very clearly outside. There was not really any wind, but there was absolutely no background noise! So far I'm impressed. Plan is to check them out in earnest next week (when it warms up a bit) as we have to go out for a dump trip. We used the EarTec for the first time yesterday and again today, and I'm totally impressed with the quality of the Communication system. 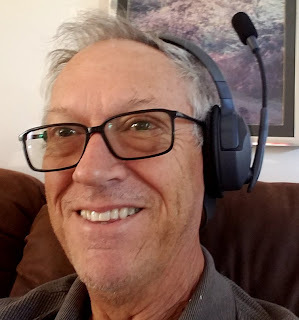 We both wore our headsets from leaving the dock until we had the sails hoisted and were making way to our destination, we turned them off at that point - There's no Off switch for the Remote headset. but holding the top button (of three) in for 4-5 seconds shuts it off. 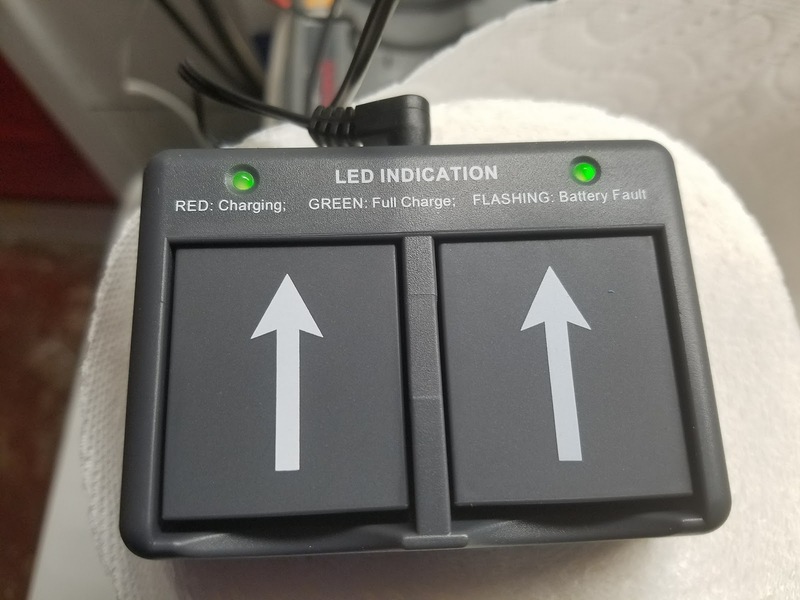 As the manual instructs, the fact that the button is not illuminated it does not mean the set is turned off! So the procedure to turn the Master headset off is simply to flip the switch on the underside of the battery compartment, and on the Remote, hold the top button in for 4-5 seconds. Later in the day as we were preparing to anchor, we both donned our headsets and turned them on. The master is straight forward, just flip the switch on the underside of the Battery compartment to 'on'. To turn the Remote headset on, press the top button, the blue LED will flash as it pairs to the Master and then turn solid once pairing is complete. Ours paired right away and again the audio quality is excellent. At the end of the day I removed the batteries in order to charge them, there's no method of charging them in the headsets. Removing the battery is simply achieved by pressing the small button on the underside of each headset, the battery bay door flips open and the battery can just fall out, no fiddling to try and get them out, easy. After inserting the batteries into the battery charger, I plugged the charger into our small 450watt inverter, it's a smart inverter and will shut down when there is no load in order to save battery power. That's great, but the EarTech battery charger does not draw enough current to hold the Inverter on. So it immediately shuts down, which means we cannot charge the batteries on the boat. Grrrrr. Eartec makes a 12v adapter but not a USB adapter and I have several USB Sockets on Eximius, so I'm going to make one. 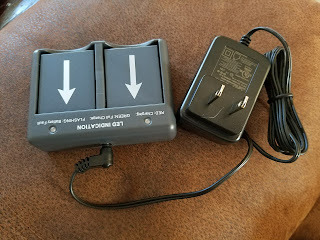 As it only connects to the Battery Charger and not the actual headsets, I'm not concerned about damaging them. As mentioned before, the 110v Charger adapter has an output of 5v dc which is the typical power output of a USB charger. A quick google search found the wiring for a USB connector, and the Charging adapter has it's diagram same as shown below. Here's my drawing of the Adapter wiring. Easy. I found an Un-used USB charging cable in the Garage. Cut the phone end from that and opened the ends. Then cut the EarTec battery charger cable leaving about 18" from the Plug end and cut that cable open. Matched up the +ve & -ve wires, positioned some heat shrink over the thin wires and the outer wire covering. Soldered the wires and shrank the heat shrink. Cable complete, not pretty, I didn't have the appropriate Black Heat Shrink so used Red. 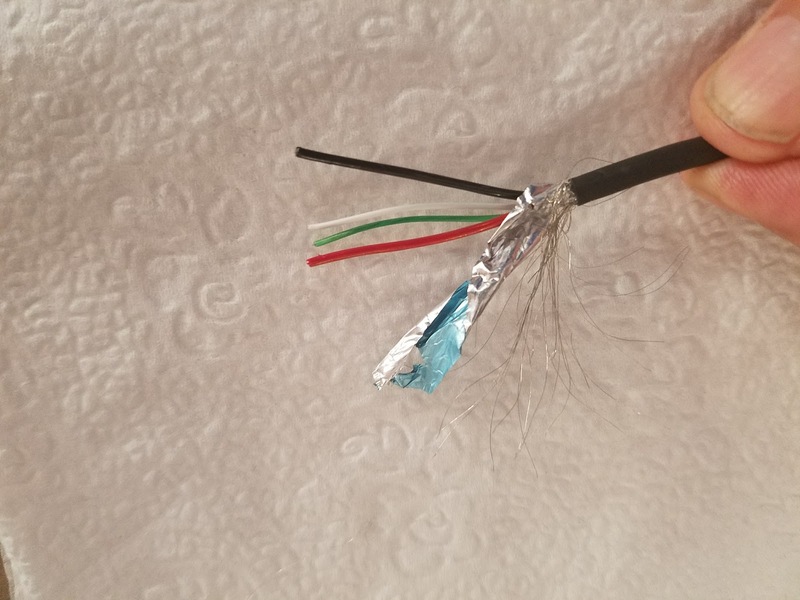 Checked out the connection using an AVO to make sure I got the wiring right. Plugged into a USB Charger wall outlet adapter. Confirmed 5v dc at the plug end. Plugged the new Adapter cable into the Battery Charger, inserted the two batteries. It showed Red (Charging) on both. Left it for 10 mins and charging is complete. Added benefit, don't need to pack the Wall adapter that came with the EarTec kit. With the new Charging Adapter I'm happy that I can charge the batteries on the boat without having to run our 2KW Inverter which probably uses more power than the charger just to turn on. Mr Happy. 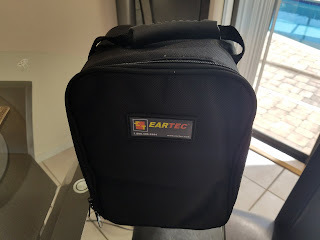 I totally recommend the EarTec headsets, get a pair, I'm sure you'll love them. See you on the Water - smiling!